A tailored petite dress in heavy crepe fabric with pleat and ruch detail to the right side. This vibrant dress is fully lined, features a slash neckline with V-split, pleated capped sleeves and fastens to the back with a concealed zip - where it also has a single vent. The perfect pop of colour for any woman’s work wardrobe. Petite dress length from the highest point of the shoulder to hemline is 92 cm. COMMENTS : Thank you Jeetly. Beautiful fit and love the colour! Perfect dress for me as an investment banker as I was looking for a day dress that looks equally great for client drinks in the evening. Really well made, also like the fact that the lining has stretch too. 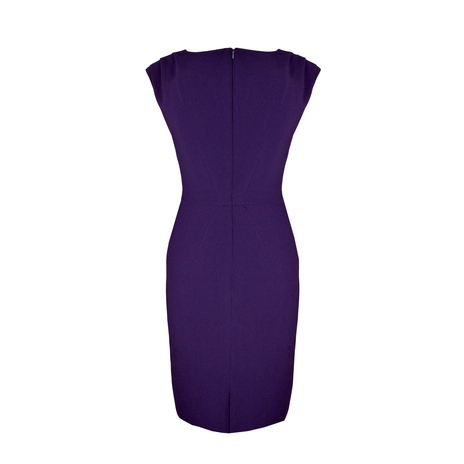 COMMENTS : The purple dress I bought in size 12 is so elegant and extremely flattering so I am delighted with that. Now I have heard of you I will use your site again as it is brilliant for petite women! KR, Michelle. Accessorise with gold jewellery and bright orange heels for evening. A statement gold belt works well for that office party.